It is a story unfolding in real time... as a persecuted people takes to the sea to escape what is being called nothing short of genocide. Boatloads of Rohingya migrants floating in the Andaman Sea while mass graves have turned up in both Malaysia and Thailand. "We are floating for four days, we have no food ... so hungry. I see the fisherman light, we said hello, please help us, we will die." - 21-year-old Mohammad Rofi, a Rohingya refugee. Like so many Rohingya right now, Mohammad Rofi has been in the middle of a very traumatic situation. The boat on which he was travelling was adrift for two months before being spotted by a fisherman, and taken to shore. Thousands of others, on the seas of South Asia, are still hoping to get to shore.They're fleeing religious persecution.... In fact, the U.N. calls Rohingya Muslims one of the most persecuted people on earth. They live in Western Burma, also known as Myanmar, and they've been fleeing to countries such as Bangladesh, Saudi Arabia, and Pakistan, by the hundreds-of-thousands. But many who are trying to escape by boat have found themselves stranded -- turned away from other countries. And in the past two weeks, an already dire situation became even more bleak -- with the discovery of mass graves in Malaysia and Thailand, believed to hold refugees killed by the smugglers who'd promised them passage. Zaw Naing is a Rohingya activist now living in Cologne, Germany. Burma isn't alone in its mistreatment of the Rohingya. 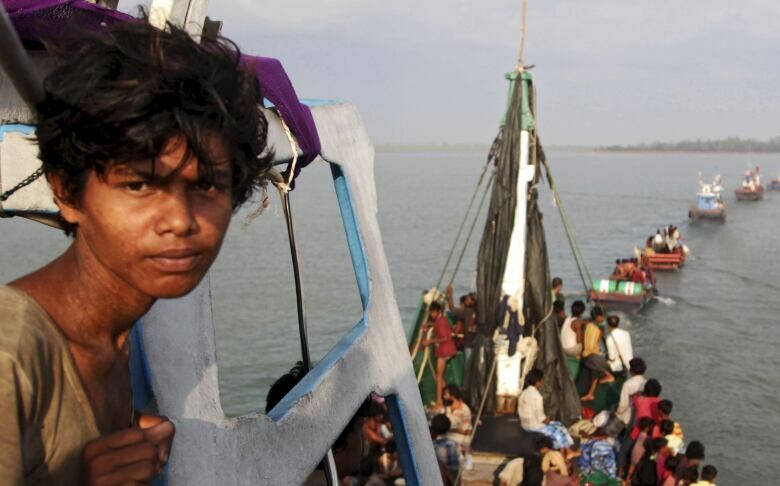 Earlier this month, Malaysia and Indonesia both turned away a boatload of Rohingya refugees and sent them back out to sea. After international condemnation, those governments have since said that they will take in the next Rohingya migrants who arrive in their waters. But Charles Santiago says regional governments need to do more than that. He is a member of the Malaysian Parliament and the Chair of ASEAN Parliamentarians for Human Rights. ASEAN is the Association of Southeast Asian Nations. Charles Santiago was in Kuala Lumpur. The treatment of the Rohingya has human rights advocates deeply worried about where this is leading.Andrea Gittlemanis the Program Manager for The U.S. Holocaust Memorial Museum's Simon-Skjodt Center for the Prevention of Genocide. She was in Burma earlier this year and helped write a report published earlier this month, which concludes that many of the early warning signs for genocide are present in Burma now. Andrea Gittleman was in Olso, Norway today, for a conference on the Rohingya issue. We did request an interview with Burma's Ambassador to Canada. He was not available this morning. This segment was produced by The Current's Pacinthe Mattar, Gord Westmacott and Natalie Walters.